Sunday School Classes are available for all ages. These classes meet at 9:00 a.m. each Sunday morning in the education wing. Please see the Sunday school section for more detailed information about available classes. Worship KidStyle for children in grades 1-5 meets most Sundays during the 10:00 a.m. worship service. 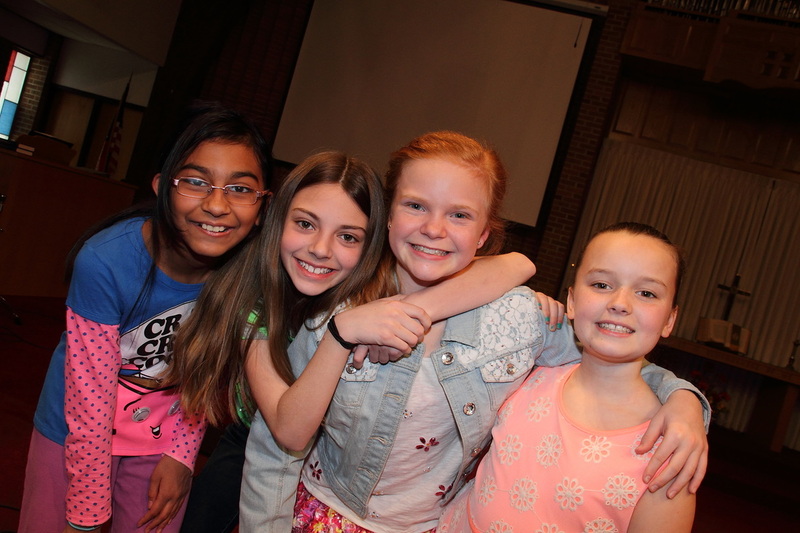 Children attend worship with their families at 10:00 a.m. until they are dismissed (see weekly bulletin) during the service to attend a Bible lesson that complements the message being shared by Pastor Strawn. Please pick the children up in the library on the lower level of the education wing immediately following worship. PrimeTime Wednesday: Meets each Wednesday evening beginning with an optional supper at 5:00 p.m. Following is a more detailed list of events for all age groups. Preschool/Kindergarten: We lead music, do scripture memory, have a bible story and play time with children age 4 through Kindergarten from 5:30-7:00 pm. Grades 1 - 6 : Kim Henness and Susan Maninfior will lead music for this group from 5:20 to 6:00 pm. These children sing during the 10:00 a.m. worship service several times throughout the year. Twice a year, at Christmas and in the Spring, these children present a musical at the 8:00 and 10:00 a.m. worship services. Following music, children ages 1st-6th grade will meet with volunteers to work on committing scriptures to memory then begin a weekly rotation including Bible Story, Willing Hands Kids Club, and Games. The children have the opportunity to earn awards as they dive into God's word. We are always looking for wonderful volunteers who love to guide young people through their adventure into the Bible. Pick up instructions: Students age 4-grade 6 need to be signed in and out of the program each week. They may sign themselves in (after completed registration forms have been received), but they need to be signed out by an approved adult or sibling in 7th grade or above. Because of the high traffic volume in the parking lot, students will not be dismissed to leave on their own. Children age 4 – Kindergarten should be picked up in room 26 upstairs, all other children and youth may be picked up in the gym. Grades 7 - 12: This group meets with Kim Henness and Susan Maninfior during Prime Time Wednesdays to prepare for leading in worship. This group may lead using music, drama, and by serving in leadership roles during worship services. They serve as praise team several times throughout the year, offer special music, and participate in the Christmas and Spring musicals during the 8:00 and 10:00 a.m. services. Willing Hands Kids Club gives children entering grades 2-7 the opportunity to show God's love through service. This group usually meets at the church on 4 consecutive Tuesdays from 9:00 a.m. to 2:00 p.m. Over the years, the group has served the Joy Givers, Mattoon Community Food Center, Food on the Move (administered by the Salvation Army), Catholic Charities, and individuals in our own congregation. If you have ideas for service projects, please contact Kim Henness. JAMPAC (Jesus and Me Performing Arts Camp) is a three day camp usually held in June for those who have finished 1st grade through 6th grade. For the past several years, we have done this camp with the Broadway Christian Church. JAMPAC 2018 will be held at First Baptist Church. Kim Henness is the contact person. Camps for all ages are available during June and July at Lake Springfield Baptist Camp in Chatham, IL. Please contact Kim Henness for more information.